If you demand the elite in your equipment and accessories, then you will quickly own this beast! 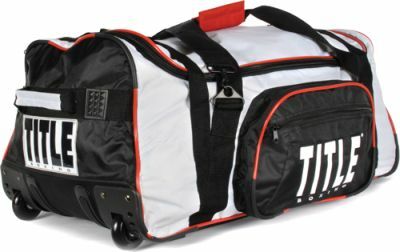 The ultimate in style, performance, flash and delivery for all your gym and travel needs. Double-thick denier ripstop nylon is built to go the distance. A full length double-zipper U-shape top opening unveils a multitude of storage space for all your equipment and essentialsâ€¦and more. Two opposite side extended zipper pockets are ideal for easy access items. Includes two seat belt nylon end handles, two adjustable nylon cargo straps with buckles, an adjustable and detachable padded shoulder strap with exclusive Gel Enforced LiningÂ® for the tops in performance and comfort, a zippered telescoping pull out end handle, and heavy-duty rubber wheels for travel and transportation. Complete with dazzle applique and embroidery, high quality screens, embossed labels and bottom skid plate protectors. Size: 32" x 20" x 14"